Our social activities during the early part of the century were varied, of course, mostly man-made so to speak. We did not have to travel so far to have a good time, unless we made a night of it, as I did the first night I came to Madras for a dance in Feb. 1904. I came over from Hay Creek in a spring wagon and team; there was no open road, just a trail with thirteen gates. I know, because I opened them both ways. 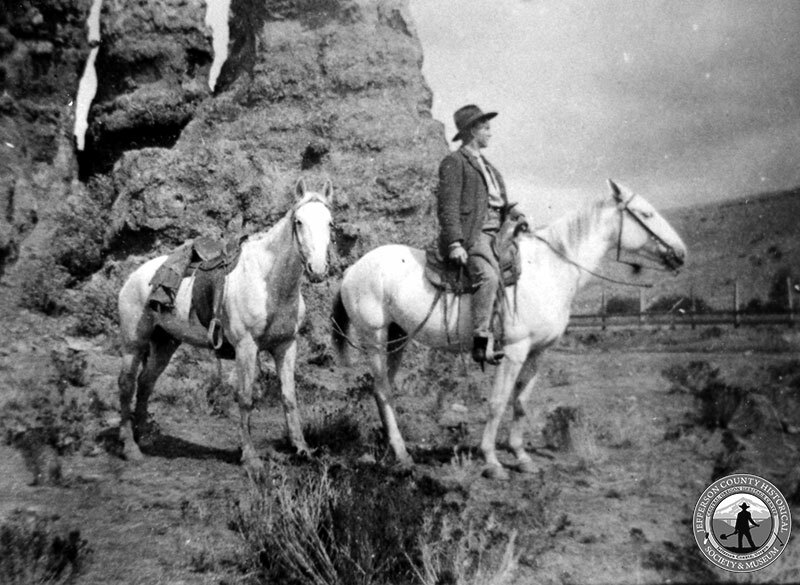 Howard Turner at Hay Creek Ranch, 1900. We were all night and the dance was held in the second story of the J.P. Hahn Hotel that was not completed. The next morning we wanted breakfast before returning home, so went down to Tom Meloy’s place and Mrs. Meloy fixed up the following: coffee that would hold up an egg, sour biscuits that were really sour, cold side pork and cold potatoes, with butter that had seen better days. But I guess we did not complain. I think we paid 35 cents for the experience. Dances, pie socials, literary societies, spelling bees, as well as church activities were the principal amusements. Later on came the first picture show, in 1910 . . . .